This is a photograph of four individuals affiliated with the New York Giants. In this group of players are Virgil and Clark Barnes of Jackson County, Kansas. The photo is undated but likely was taken in March 1928 in Augusta, Georgia. Virgil Barnes was a right-handed pitcher with the Giants at the time. His brother Clark, also a pitcher, was invited to work out with the team during spring camp, but the tryout was cut short when Clark was hospitalized for an emergency appendectomy. Clark is pictured on the far right, with Virgil standing next to him on the left. The two others in the photo are unidentified. Four Barnes brothers--the sons of Luther and Sade Barnes--hailed from Circleville, Kansas, and all had major league aspirations. Jess and Virgil both pitched several years at the major league level. The two younger brothers, Charles and Clark, received tryouts with major league teams but did not make their rosters. At the time this photo was made, Virgil "Zeke" Barnes was nearing the end of his major league career, which included seven complete seasons in the 1920s. He pitched for the New York Giants for most of his career but was traded to the Boston Braves during his last major league season. Virgil's best year was 1924, when he had an ERA of 3.06 and a record of 16-10. He had 61 major league wins, with a career ERA of 3.66. He made World Series appearances in 1923 and 1924, including the starting assignment in Game 7 of the 1924 World Series. This is a photograph of four individuals affiliated with the New York Giants. 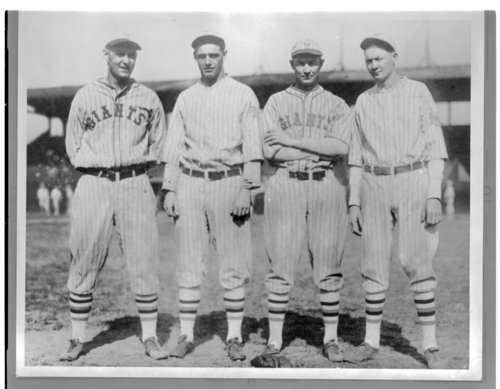 In this group of players are Virgil and Clark Barnes of Jackson County, Kansas. The photo is undated but likely was taken in March 1928 in Augusta, Georgia. Virgil Barnes was a right-handed pitcher with the Giants at the time. His brother Clark, also a pitcher, was invited to work out with the team during spring camp, but the tryout was cut short when Clark was hospitalized for an emergency appendectomy. Clark is pictured on the far right, with Virgil standing next to him on the left. The two others in the photo are unidentified. Four Barnes brothers--the sons of Luther and Sade Barnes--hailed from Circleville, Kansas, and all had major league aspirations. Jess and Virgil both pitched several years at the major league level. The two younger brothers, Charles and Clark, received tryouts with major league teams but did not make their rosters. At the time this photo was made, Virgil "Zeke" Barnes was nearing the end of his major league career, which included seven complete seasons in the 1920s. He pitched for the New York Giants for most of his career but was traded to the Boston Braves during his last major league season. Virgil's best year was 1924, when he had an ERA of 3.06 and a record of 16-10. He had 61 major league wins, with a career ERA of 3.66. He made World Series appearances in 1923 and 1924, including the starting assignment in Game 7 of the 1924 World Series.